Elf Day is the Alzhiemer's Society fabulous festive fundraiser designed to get you in the Christmas spirit whilst raising money to help beat dementia. Helen Thewlis, Head of Family at Ramsdens got elf’ed up and raised a WHOPPING £556.05. 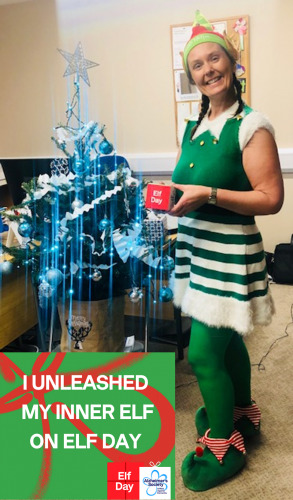 During her day as an elf she delivered selection boxes to the Laura Crane Youth Cancer Trust Christmas Appeal, delivered food donations to the Holme Valley Foodbank, handed over presents to Pulse Radio’s Christmas Toy Appeal and also attended the Huddersfield Annual Accountants Christmas Lunch. The Alzheimer’s Society invest substantially into dementia research, and commit a large amount of funding to cutting-edge research which has led to many breakthroughs with regard to this disease. It wasn't just Helen that got behind this year’s #ElfDay, Ramsdens entire Private Client team did too.